Is it where you were born or raised? Is it where your family or friends live? Is it bounded by bricks and mortar or is it simply where you are at now? Over the last four years I have lived in a variety of houses and flats, depending in many cases on the generosity of friends and family who have provided me with safe havens. Yet once I have gone out of my front door in the town which I had called home for nearly thirty years I have not felt safe and I was constantly looking over my shoulder. I realised quite how edgy I had been feeling when I was walking through the streets of Havana on my own in the dark. I felt a lot safer walking down the middle of the road where nobody knew me (or to be precise, where I was confident that AW would not be around) than walking around my home city in the UK in the daytime. Pedestrians keep to the centre of the road because there are no streetlights in the suburbs of Havana and dangerous potholes lie in wait on the pavements – the roads too but they are more visible – all due to the economic situation there. But people live their lives outdoors. Partly due to the heat as very few people can afford air con, often due to overcrowding in the homes – a side effect of the government policy of ensuring that nobody goes without a roof over their heads and also because for the Cubans people-watching and communicating with friends and neighbours is a free activity and there is a massive sense of community. 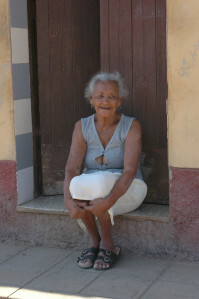 Cubans sit on their front porches and watch the world go by so in the main, you are very visible and crime is low. Since giving up the tenancy on my flat and setting out on my adventure I have no physical home of my own. I have a few small items which travel with me and constitute my ‘home’. Rather like the lyrics in that song which compares a pack of playing cards to a Bible, my little treasures link me to friends and family. 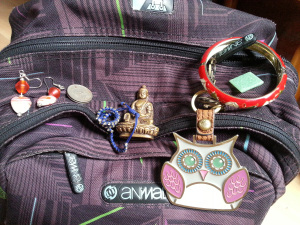 I have my owl key ring which is attached to my smaller rucksack, my lucky Buddha whose size does not correlate to its leaden weight, a couple of pairs of earrings, a red bangle and a friendship bracelet, my silver thumb ring and my worry ring, a couple of cards and letters which I carry, a 5 rupee Indian coin, a green mosaic tile from a swimming pool and my St Christopher necklace. I also have my phone with music and photos of friends on, my netbook with the same and memory sticks loaded up with pictures too. It’s actually no wonder that my rucksack is so bloody heavy! These items were all given to me or bought by me for different reasons. I have other items stored away which I would love to have with me, but short of upgrading to pushing a supermarket trolley around with me (and THAT would be the slippery slope to shuffling around and have kids yell ‘mad bag lady’ at me) those things will have to remain safe in the UK for now. I have endowed some of my treasures with multiple meanings. I am not superstitious and having previously lost many valuable and sentimental possessions I try not to get too emotionally attached to items, but perhaps a little bit of me wants to remain rooted to what, or more specifically who I have left behind. I totally agree with Terri, very well put! Home is wherever you want it to be, it doesn’t have to be a permanent place, it can be within yourself. We are only left behind in body, we will always be here to take the piss or support whatever is suitable at the time tee hee! You carry on following your dream, which is a reality, many haven’t the balls to do what you have done and that goes for this post and the last, we are all so proud of you. Have a ball (not of the aforementioned type of course), be careful though and know you can visit any time you want, we’re here. what a lovely post. I do enjoy reading them and I find myself agreeing with everything the other people have written but I would like to add one other point if I may. Items that you bought, I suspect, reminds you of events or happy times. But I believe the ones given to you possibly hold more value as these were given to you out of love. Romantic or friendship, these will be the items that will help raise your spirits when you are feeling a bit down for you will not be able to not think of the people who gave them to you when you look at them.